MCX Marketing Sdn Bhd, established since 1996 is a marketer of adhesives and sealant products in Malaysia under x ‘traseal®’ brand. 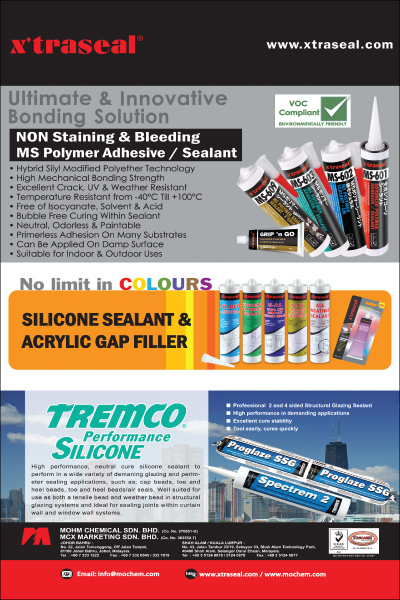 We offer a complete range of adhesives and sealants such as Acetic and Neutral Silicone, Acrylic, PU, Butyl and Neoprene Sealants, Awning and Roofing Caulk, Non-skinning Mastic, Construction Adhesives, Hi-Temp RTV Gasket Sealant, Epoxies Adhesives, Liquid Gasket, Metal Polish, Exhaust Cement, Penetrating Oil, Butyl Tape, PVC Solvent Cement, Contract Adhesive, Light Weight Filler and many others. All these are suitable for construction building, automotive industry, diy household and so on. Some of these products are available in an environment friendly sausage foil packing. We also specialize in offering customized color sealants and products to extend this specialty, we’ve launched the x ‘traseal®’ Colosil Multi-Color Sealant and x ‘traseal® Colofil Acrylic Sealant. Both of these come in a range of attractive colors. This will enable the sealant applicators to choose the suitable colors to match the colors of most construction materials as these colors are most demanded from architects and designers.